The term isothermal humidification has been established to describe a steam humidification process in which air temperature essentially remains constant. Depending on the system, a humidification process which uses stream can be controlled to a very precise degree. Such a process also shows an excellent level of hygiene quality because it uses a medium which is at a temperature above 100°C. A steam humidifier's mode of operation can be electrical or gas-fired. In contrast to evaporation humidifiers, a steam humidifier generates steam before the mixing process. The steam in this process can then be fed into indoor air directly via a ventilation unit, or added to the air in an air conditioning system during conditioning. The steam is either taken from a central steam generation unit or produced decentrally for air conditioning at the point of humidification. Units which carry out humidification using pressurized steam from a central production location are known as pressurized steam humidifiers. Steam humidifiers of this type are used together with A/C (air conditioning) systems. This humidifier consists of a strainer, rotary slide valve, manometer and condensate drain. Electrical steam humidifiers are often a good option when steam needs to be produced immediately at the point of consumption. Electrically driven steam humidification operates either according to an electrode principle or resistance principle. In the case of electrode humidifiers, grid-shaped metallic electrodes are immersed in the water container of the unit and make use of the water's conductivity. The current in these humidifiers flows directly over the water medium and evaporates it. In this principle, the amount of steam produced is controlled through the level of water filled in the steam cylinder. In the case of resistance steam humidifiers, humidification water is heated according to the principle of immersion heaters. 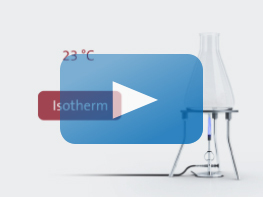 In the case of isothermal humidification, water must first be heated to 100°C. In the process it reaches a heat content of h = 419 kJ/kg and a pressure of 1.0133 bar. A change in state occurs at this point, and the boiling water at 100°C is converted into steam at 100°C. 2,258 kJ of energy must be provided to each kg of water in this process. This energy required for the conversion to steam is known as the specific evaporation heat. As this energy is latent, it cannot be measured using a thermometer. Steam is considered “saturated” as long as it remains in direct contact with water; in other words it is unable to absorb additional liquid and is therefore also known as “saturated steam”. Unsaturated steam is produced when the temperature of the heat provided remains the same even though the volume of steam increases. Condensate is a key characteristic in this process. As steam cools down, the evaporation heat invested in it withdraws, its state changes and condensate is produced. The lime content of water is in equilibrium with carbonic acid dissolved in water. The carbonic acid in water is driven out when the water is heated (for example in a kettle or during steam humidification). The decreasing carbonic acid content causes the water solution to not be able to hold as much lime. The excess lime then precipitates in the form of visible deposits, i.e. calcium carbonate. A determination of water hardness also allows for a prediction of the intensity of calcification. 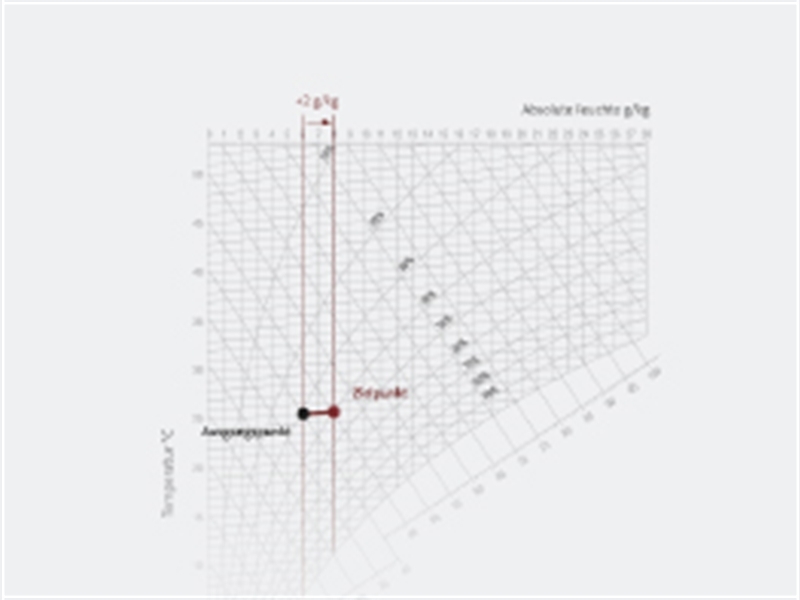 Water hardness is a conceptual system from applied chemistry which was developed from the needs which arose due to the use of natural water with its dissolved constituents. To be more specific, water hardness became the term used in specific contexts to describe the equivalent concentration not only of the alkaline earth metal ions dissolved in water but also their anionic partners. These “hardeners” essentially include calcium and magnesium as well as trace amounts of strontium and barium. The dissolved hardeners can form insoluble compounds, mainly lime and so-called lime soaps. This tendency of hardeners to form insoluble compounds was the basis for the interest which led to creation of the conceptual and theoretical system surrounding water hardness. Soft water is better for all applications in which water is heated, including washing, watering houseplants, etc. Soft water is present in regions with granite, gneiss, basalt and slate stones. Rainwater is also considered soft water. Hard water leads to calcification of household appliances, causes increased consumption of detergents and affects the flavor and appearance of delicate foods and beverages (e.g. tea). Hard water comes from regions in which sand and limestone predominate. The chalk management system patented by Condair can be used to reduce the calcification which occurs during steam humidification. This system peels lime deposits off of heating elements then draws these off using an external limescale collector tank. De-ionized water can also be used to remove minerals and calcium in advance, right from the water purification process. The amount of lime buildup which remains is then at a negligibly low level. However, it should also be noted here that it is not possible to operate all humidifier types using softened (i.e. mineral-free) water. Mineral-free water can be used to operate a resistance humidifier. On the other hand, an electrode humidifier requires conductive water which contains minerals in order to be able to work efficiently. Using softened water to operate this humidifier type therefore does not make sense from an energy standpoint.